In my opinion, Sleepy Hollow's second season had two major flaws: 1) Failure to fully highlight the show's greatest asset, which is incontrovertibly the friendship between Abbie and Ichabod and 2) not making the decision to turn Katrina evil earlier than the penultimate episode so that the momentum of the season could be better focused. These problems stacked on top of lesser – but still significant – issues, like the redundancy of Nick Hawley (whose role as an expert in legendary artifacts could’ve been filled by Jenny) and the poor utilization of Frank Irving, another interesting character we didn't get to see a whole lot. That latter point is doubly frustrating since we all know Orlando Jones isn't going to be around for season three. I mean, they could have given him a big send-off last season and I would have been fine with losing the character for this season but, no. I suppose, at the very least, season two gave Irving a pretty awesome sword fight scene. What’s in store for season three after that rocky second season, though? There’s been a lot of buzz about getting the show back to its first season vibe, but will they be successful? Before we get into the premiere, here’s a reminder of what you need to know: Last season, Katrina went a bit evil and then a bit more evil after Henry (a.k.a. Jeremy Crane) was shot and then died. She tried using a time travel spell to kill Ichabod back in 1781, but thanks to Abbie and great-great-great grandma Grace Dixon, she failed. Katrina was unhappy about said failure, tried strangling Abbie to death, fought with Ichabod and got killed in the process. Ichabod was pretty sad because his wife just tried to kill his best friend and also turned evil and died. Big picture, though: Moloch and all associated minions were destroyed! Apocalypse averted! Of course not, what do you think season three is going to be about? Ichabod picking out china patterns for his new condo? We open up on the Headless Horseman in a really well-done sequence. Ol’ Headless –– the baddie of yester-season –– runs into Pandora, who has a box (of course) and is the baddie of season three. She’s actually pretty interesting and creepy and seems to have a lot of power, because she just shoves the Headless Horseman into that box of hers and that’s the end of that. Want a good way to show the increase of power from one villain to the next, budding writers? Have the new villain shove the old one into a box. Works like a charm. After we meet Pandora, we get to see Abbie again and she’s being cool and hitting fleeing criminals with trashcan lids and it’s great. Still, though –– we could hardly have one Witness without the other, so we’re moved quickly along to her reunion with Ichabod, who had been thrown into the Immigration and Customs Enforcement detention center four days prior for trying to “smuggle” artifacts from his ancestral home (crypts?) in Scotland. I really wish we’d gotten to see the hissyfit Ichabod doubtlessly threw once he’d been put into handcuffs. I bet he name-checked at least three of the Founding Fathers. Anyway, it’s very clear that Ichabod and Abbie haven’t been speaking to each other during the nine months they’ve been separated and Abbie is not happy about it. Ichabod’s going through some stuff, obviously, after the deaths of his family members but Abbie’s problem is with the fact that he hasn’t included her in his mourning or soul-searching or whatever it was he’d been doing for almost a year. It’s totally understandable, since she’d told him about her past and her fears and all the painful stuff related to separating from Jenny, the backstory on her parents, and the loss of Sheriff Corbin. The least he could’ve done was let her in on whatever was going on in his head and not just disappear for nine months. Ichabod’s excuse is that he wanted to find himself and where he fit in the grand scheme of things. “Fitting in” seems to be a theme for the characters in this episode. Ichabod’s struggling with finding his purpose in the world, which is what led him to Scotland and to the old tablet he found there –– and, from that, to the insistence that his and Abbie’s roles in the Apocalypse aren’t over. But Abbie has very much found her place in the world as the FBI agent she’d been on the way to becoming before Ichabod woke up from his centuries-long nap, and she’s certain that her former destiny is done and over with. Abbie missed Ichabod –– it’s clear that she missed him –– but she believes her role as a Witness ended with the deaths of Moloch and Henry and wants no part in his quest for more supernatural beasties in Sleepy Hollow. She humors Ichabod with his claims of future “tribulations” but doesn’t believe the monster of the episode –– the yaoguai –– is anything more than an old Moloch underling that missed the memo on the end of the End of Days. Our heroes defeat the yaoguai –– well… Abbie defeats the yaoguai, because she’s awesome and comes in guns a-blazin’ when things go south for Ichabod and Jenny. Either way, the monster of the week is defeated and Abbie refuses to think this means that her role as a Witness is still happening. But then, the tablet Ichabod found in Scotland is released back into his possession and Abbie finds a hidden section on it with more prophetic carvings: two figures that resemble Abbie and Ichabod, captioned with the word "destroyers." Abbie is not completely on board the destiny train, but now she does acknowledge that her work with Ichabod isn't over. The “fitting in” theme of the story applies to the episode –– and the show –– itself, as Sleepy Hollow is trying to find its footing again after the messiness of season two. “I, Witness” proves we’re off to a good start, with everything from the smooth introduction of the new villain to the classic Ichabod/Abbie banter working perfectly throughout. 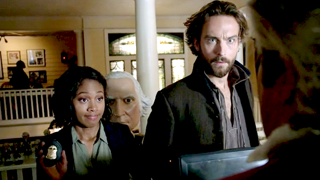 It had a lot going for it: the classic weirdness of Sleepy Hollow, putting Ichabod and Abbie’s partnership back at the forefront on the show, and terrifically twisting some American Revolution history in that way that only Sleepy Hollow can. Overall, the episode did a great job making me remember why I love this show so very much. I don’t grade my reviews but, you know, this one gets an A.
Ichabod’s “modern outfits” so far: 1) skinny jeans, 2) prison uniform. Yeah, Ichabod should stick to his old clothes. “Evil has returned to Sleepy Hollow.” Replace “evil” with “wonderfulness” and italicize Sleepy Hollow and you’ve got my assessment of this episode. This show’s opening credits are still some of the best around. Ichabod shifts his translation of the Bible from seven years of Tribulation to seven tribulations. This has the added bonus of not locking the show into seven seasons. How can the town demolish the Archives?! It’s got historical value! Do we need to get the folks in Sleepy Hollow to listen to the Hamilton musical and re-evaluate their priorities regarding American history? Jenny’s character development in this show is amazing and I love it. Irving’s in something like “witness protection.” Yeah. As in, protection from the Witnesses and the landslide of crazy they dumped into that poor man’s life. We didn’t see much of Betsy Ross but I’m sure we’ll see more. I’ll hold off on commenting until then. One thing, though: there were some women in the American Revolution who actually did disguise themselves as men, the most famous of which was probably Deborah Sampson (Hey there, fellow Deborah!) and I wish they’d picked one of them instead of shifting Betsy Ross into the role. “The corner goes at the front! You’re not a pirate!” Oh, Ichabod in that Colonial-themed restaurant was golden. The horror in his eyes. I’m actually really looking forward to the Pandora storyline and character. Also, I realized that I recognize the actress from the movie A Knight’s Tale. That was bugging me. What exactly is the "resemblance" between Abbie/Ichabod and the Sumerian-Akkadian carvings? The height disparity? What did you all think about Sleepy Hollow's return? Let us know in the comments below!